2 – Choose Properties from the submenu. 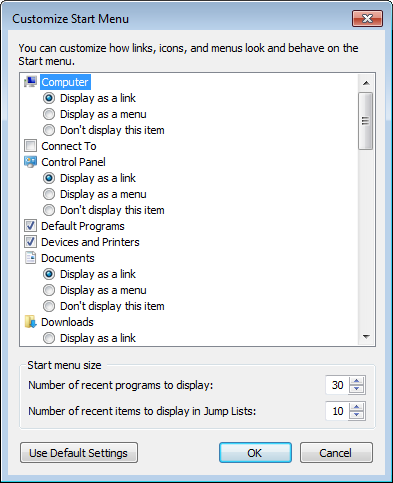 The main list box controls the way the links are displayed and how they act in the Start Menu. You can also control which system links you do and do not want to display. These two counters control the number of recently opened programs to display as well the number of recent items to display in the Jump to list. How to Display the Maximum number of Programs in the Start Menu. From the main list box in the Customize Start Menu dialog box, scroll to the bottom and search for the check box called Use large icons and disable it. Then change the Number of recent programs to display to 30 (which is the maximum).